They are courteous, attentive, and not afraid to make suggestions for your dinner selection (or to tell you that you're ordering too much...such as with the single schnitzel we had last night that fed two of us, with leftovers for lunch today!). One of the delightful aspects of living in Brazil is the service in the restaurants. 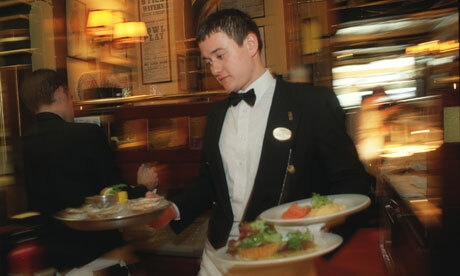 Here, unlike in the United States (other than at very nice restaurants), service is a profession, not just a job. The men (mostly men) who serve the clientele are typically dressed in black pants, white shirt, tie, and vest or apron. And they seem to take great pride in what they do. They are courteous, attentive, and not afraid to make suggestions for your dinner selection (or to tell you that you’re ordering too much…such as with the single schnitzel we had last night that fed two of us, with leftovers for lunch today!). At our local restaurants, we’ve learned the names of our servers, and greet them each time we enter (Sandra, Edemar, Joao, Edson, Manolo). They’re always very polite and solicitous, and we always thank them for their service. The gratuity is built into the final cost of the meal, so their service doesn’t dictate their tip; they just offer great service for its own sake. Throughout the meal, they float nearby, watching carefully to see if you need anything, or swooping in to refill your plate with another slice of pizza (you don’t serve yourself, and you eat it with fork and knife), or helping of schnitzel. If you are having choppe, they’ll bring a new glass anytime yours gets down to an inch, and mark the count on the paper at the table. At the end of the meal, they’ll offer a sobremesa (dessert), and then after that (not with), a cafezhino (small coffee, mostly espresso). And you can sit at the table for as long as you like. There’s no placing the tab on the table and saying, “No rush, pay whenever you’re ready,” as they do in the States. When you’re ready, you signal pen to paper and they bring the conta over. Come time to pay, you signal again and they come to the table with a handheld credit card machine, and the card never leaves your sight. When you leave, the servers all bid you adieu, even those who didn’t serve you. Very civilized, né? Previous Previous post: It’s a Capybara!